Lucky the lamb faces some challenges when she finds herself stuck in a bad situation. Thankfully, she has been blessed by a new friend that helps her out of a tight spot. 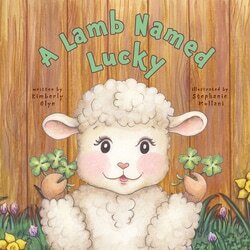 A Lamb Named Lucky is the second in the Sunnyside Book Series. All books in the Sunnyside Series are faith-based children’s books that highlight the brighter side of gloomy situations. The first book, A Skunk Named Perfume, is also available on Amazon.com and Barnes & Noble.com. Available on A﻿mazon﻿ and Barnes & Noble.com! Kimberly Glyn is a Christian Children’s book author from Eagle, Idaho. She began writing stories to share with her sons, Liam and Leo, and soon realized that God had a bigger purpose for her; to focus on writing Christian books for kids and to share His love with others.